Fifa has confirmed that Sunday's Confederations Cup final between France and Cameroon will go ahead in Paris despite the tragic death of Marc-Vivien Foe. Cameroon midfielder Foe collapsed on the pitch during the second half of Thursday's semi-final in Lyon. Cameroon won the match, against Colombia, 1-0 and will now play France, who defeated Turkey 3-2, on Sunday. "It will be a collective tribute of respect and solidarity towards Marc-Vivien Foe," said Chuck Blazer, the head of the tournament's organising committee. Fifa president Sepp Blatter said Foe's team-mates wanted the game to go ahead. "They all agreed, they even applauded - they want to play this final," said Blatter. "I asked 'what would make Foe happy now - if he knew that you were in the final, would he have applauded?'. At that moment, everybody burst into applause. "My opinion is that during a competition like the Confederations Cup, football must go on. "This is the first time in 28 years with Fifa that such a tragedy has occurred. I followed the match on television, I saw the player collapse and very fast I had a bad feeling." 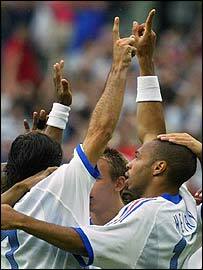 France captain Marcel Desailly had questioned whether the final should be played. But Blatter said: "Now that Cameroon have said 'Of course we are going to play', do you think that France will bring this into question?" The Fifa chief also revealed that the next Confederations Cup may be named after Foe. "We have already had a proposal that the next Confederations Cup would bear his name. "It is an excellent idea which we will study," added Blatter. The Cameroon side will all take to the field on Sunday in shirts bearing Foe's name. Fifa has cancelled the entertainment that was planned for before and after the match as a mark of respect. Cameroon is planning a national day of mourning. "A national day of mourning will be made to remember this player of ours," said Prince Noki Nukete, assistant general secretary of the Cameroon Football Association.